Figures are from May 2016. Sources: UNHCR, IND, COA, and Dutch ministry of Safety and Justice. Written by Marieke van der Velden,. Why don’t people stay in the region, it is safe there too isn’t it? 85% of the refugees are still in the region. For example Lebanon, a country which is three times smaller than the Netherlands, now has some 1.4 million refugees. Turkey counts 2.8 million, Jordan 950,000, Northern Iraq 350,000 and Egypt 114,000 (in comparison, the Netherlands has had 43,095 in 2015). Why are the Gulf States doing nothing? According to figures from UNHCR the wealthy Gulf States such as Saudi Arabia and Qatar only took in 2,187 refugees in 2014. It is difficult to check but Saudi Arabia claims to have more than 500,000 Syrians with an expired work visa in their country who are not being sent back due to the war. It has also donated large sums of financial aid. Besides this the Syrians do not want to flee from one dictator to another. Besides sharing the same faith the Gulf States and Syria both have completely different cultures. How do the people live in the region? People who have no money whatsoever live in a tent in a camp, even with freezing winter temperatures and summer heat of 40 degrees. Others try to illegally rent a small apartment with their ever-diminishing savings. They are not permitted to work and their children may not attend school. And when the war is over, who will pay to rebuild their homes? Are there still people living in Syria? From the original 20.5 million residents there are still 15 million people remaining within the country. But from this group there are also more than 7 million people fleeing inside the country. For example in the hard-hit city of Aleppo where four years ago 2.7 million people lived now only 300,000 remain. Why is the number of refugees in 2015 so much greater than in previous years while the war has been ongoing for five years? Most of the people waited as long as possible before leaving Syria in the hope that things would get better. But after 5 years of war that hope seems to have disappeared. Over 250.000 people have died from the war, and more than one million homes have become unliveable. Family members have been wounded, killed or are missing. The stress from the insecurity is enormous, along with this the entire economy is flat, there are many schools closed, food is scarce and there is no gas or electricity in many places. Friends and family leave. The sense of hopelessness from all of these combined factors results in the decision being made to leave the country. Why do the refugees travel to the Greek island of Lesbos? Greece is along with Bulgaria the closest EU-country to Turkey. Lesbos is only 8 kilometres from the Turkish coast. How much does a crossing by rubber boat cost? The 8-kilometre crossing by rubber boat costs approximately 1,200 dollars per person. Not including a life jacket. Because many families do not have enough money for all of the family members the men or sons often go first in the hope that they will be able to get their families to Europe later on through family reunification. Why don't people take the much cheaper daily ferry? A ticket for the daily ferry from the Turkish Ayvalik to the Greek Mythilini only costs 18 dollars. But without a valid visa people may not purchase a ticket for the ferry. Here the same is true. A ticket from Turkey to Germany costs 400 dollars. But the law dictates that airlines which allow people without the proper visa papers onto their aircraft are then responsible for all the incurred costs for bringing these people back to where they came from. But why don't people ask for a visa? Residents of Western countries can ask for a visa for more than 150 countries but Syrians are unable to do this for almost any country anymore due to the fear that they will not return to Syria once the visa has expired. Or asking for asylum in Europe from out of the Middle East? the EU there is therefore no other option than illegally crossing the sea. How much are the human traffickers actually earning? It is a million-dollar business: 1.000.000 x 1,200 Dollars = around 1,2 billion Dollars in one year. This trade is run by various mafia including the Turkish and Italian. Every day there are containers full of rubber boats and outboard motors delivered from China and organizations each have their ‘own beach’ on the Turkish side, so it is not very secretive after all. Is the sea crossing dangerous? Yes, very dangerous. Because the rubber boats are propped full with 50 people instead of thirty by the human traffickers, the boat lie very deep in the water and a single large wave can be fatal. In the summer the weather is good and the Greek sea is calm, but now in the fall and winter it is cold and stormy. There are people dying nearly every day. Why do they then go out on the sea in bad weather? Once a human trafficker has been paid the people are placed on a "waiting list'. When it is their turn they receive a message on their phone and they are transported by vans to an isolated Turkish beach. Here they must wait sometimes for days without any food or shelter. There is no possibility to postpone the date of departure. There are stories circulating about people who were hesitant due to bad weather having a gun put to their heads and being forced to get in the boat. Why doesn't anyone stop this? The Turkish-Greek border is 9,000 kilometres long with 90% being made up of water. There are only a few Frontex-ships sailing there. The Greeks do not have the capacity, within Europe there is discord, and the Turks have no interest or benefit in stopping people because they already have more than 2 million registered and unregistered refugees. What do we know about Lesbos? Lesbos is the largest Greek island in the Aegean Sea with an area of 1,634 km2. It has 90,000 residents who live mainly in the capital of Mythilini. When you drive from east to west you will have roughly 90 kilometres on the teller. Do refugees want to stay on the island? No, almost no one. Lesbos has neither the facilities nor the economy for so many people, and besides this the island is a closed island community. The island residents are already having a rough time surviving due to their own economic crisis. The average yearly salary on the island is approximately 10,000 euros. How long do they stay on the island? An average of three to six days. Everyone tries to get to Mythilini as quickly as possible where they can officially be registered as refugees. Only with those papers can a ticket for the Greek mainland be bought. Can they travel by public transportation? As long as people do not have any papers from a registration camp they are illegal. This means that they cannot buy any food or drinks, cannot travel by taxi and cannot ride on public transportation. This has created numerous heartbreaking circumstances. Families who in the blistering heat are climbing the steep mountain paths, with shortages of water, overheating and hypothermia, hunger and sleeping in the rain. How do the registration centres work? Although it now appears that there is finally some structure coming in the system for months it was very chaotic and desperate. People had to wait in line for days with their children without any food. They became under cooled and sought shelter from the rain under plastic. There were no toilets. Happily in time there were a number of volunteer organizations which tried to help the people with food or a tent. 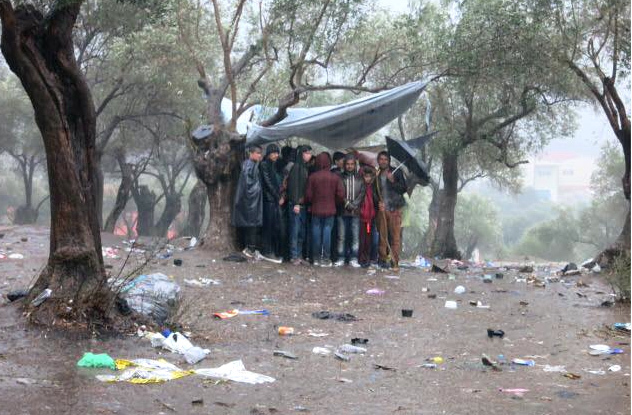 What do the residents of Lesbos think about all of this? That differs from person to person. There are people who have deep feelings of hate to those who are doing something to help. There have been great discussions on the island about how best to deal with this situation. One important factor is that a large group of residents who are reliant on the income from the summer tourism. Because Lesbos has been on the news now for the past year because of the refugees, the number of tourists on Lesbos has dropped drastically, and with this their income. Can you still go to Lesbos as a tourist on holiday? Lesbos is a large and beautiful island and tourists are very welcome. There are still enough places where you see nothing of the stream of refugees. We saw many tourists who were buying food, fruit and drinks by local merchants for the refugees (who are not allowed to buy anything as long as they are illegal). In this way they helped both groups. Is the European Union being flooded with refugees? Since the Second World War this is greatest stream of refugees on European soil. In 2015, the EU received more than one million refugees. But it is still relative compared to what Syria's neighbouring countries are being confronted with. Turkey, Lebanon, Jordan and North-Iraq combined are almost 5 times smaller than the EU and have 4.3 million refugees. The figures make clear that there is a major humanitarian crisis taking place. Worldwide the world counts 59 million refugees. Is the Netherlands being overrun with refugees? The IND (Dutch Immigration and Naturalisation Service) reports that in 2015 there were 43,090 people applying for asylum for the first time. That is more than in 2014 when only 7,252 people requested asylum. The numbers from 2015 are quite equal to 1994 for example when there were nearly 50,000 first-time asylum applications as a result of the war in Yugoslavia. How do you arrive at these figures? In these figures from the IND and the Dutch Ministry of Safety and Justice you can read about all of the numbers. But how is it possible that we read so many different figures in the media? There are various groups which partially overlap one another. This results in confusion. When we are discussing the stream of refugees which the Netherlands has been confronted with during the past year, those are people who fall into the category of ‘first-time applicants’. Those are 43,090 people. A large portion of them are still located in refugee centres because the COA is running behind with the intake interviews. They have therefore been there since before the procedure request. Besides this there were already asylum seekers in the Netherlands. They may hand in a second application if their first application was refused (just like you are permitted to an appeal process one time before a court before your options have run out). People who already have a residency permit may make an official request for family reunification. In 2015 16.010 people have done this. When you total the numbers from both groups there are currently 59,100 on-going procedures within the Netherlands. Philip and Marieke, how do you both feel personally about all of this? We also cannot give any simple answers. History shows us that streams or migrations and wars are as old as the world itself. That is the reality. On a political level we would like that, instead of focussing on the stream of refugees, politicians would instead look at the causes of this: war and power, but also the role of the war industry. It is illogical and a case of short-term politics to try and stop the result with fences without first addressing the cause of the situation. On a personal level we learned during the many conversations we have had over the past year in Lebanon, Jordan and Greece that people simply cannot ‘stop’ with their existence. Along with the right to safety, people also have the right to build on their lives and have their children go to school, without being labelled as a fortune seeker. Simply because we want that for ourselves too. The more stories we hear, the more we realize that cooperation and a sharing of the wealth is the only answer for a stable world. Remaining in denial that millions of people in the world cannot or may not participate is no longer an option in our opinion.